David Yule, professor of pharmacology and physiology, has been appointed the Louis C. Lasagna Professor in Experimental Therapeutics for five years, effective July 1. He retains his joint appointments as professor of medicine and as professor in the Center for Oral Biology. For the past 15 years, Yule has studied calcium’s role in disorders in which calcium signaling and secretions are disrupted, such as Sjögren’s syndrome—in which patients experience dry mouth due to a lack of saliva—and acute pancreatitis. 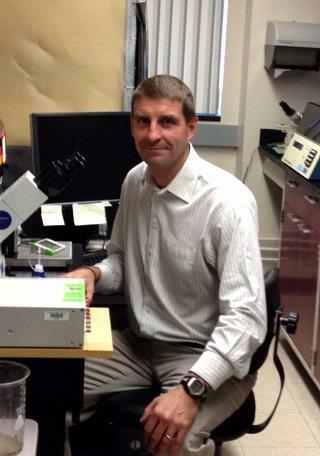 Using state-of-the art imaging and electrophysiological techniques, Yule’s lab monitors calcium signals to achieve a better understanding of the mechanisms that underlie these signals with the goal that the studies will give insight into the control of important physiological processes in both normal physiology and disease states. Yule received his PhD in physiology from the University of Liverpool in the United Kingdom. His research has been published in numerous journals, including the Journal of Biological Chemistry, Proceedings of the National Academy of Sciences, Science Signaling, and the Journal of Physiology. Yule serves on the editorial board for Gastroenterology, the preeminent journal in the field of gastrointestinal disease. The Lasagna professorship honors Louis Lasagna, who served as chair of the Department for Pharmacology from 1970 to 1983, and brought the department to national recognition as a center of training and research. Lasagna, who was known for pioneering the study of placebos and writing an alternative Hippocratic oath, died in 2003.